As per the flavor of the month in the blogging community, I downloaded the Equilab app on my phone on Monday. I was planning on having a thorough Dressage school after our very brief jumping session on Sunday. I already knew that Tuesday wasn’t going to be a barn night due to severe thunderstorms being in the forecast and Wednesday is never a barn day as I have to go straight home to take care of the best dog ever. (I might be biased… enjoy the over indulgence in puppy pics this post) As a result, Monday HAD TO HAPPEN. So Monday was marked on my calendar as a day I HAD to ride. It was also the first business day of the month, causing my work day to be even more hectic and stressful than usual. By the time I got to the barn, I was a massive ball of stress, anxiety, and frustration. I hopped in the saddle, we walked around a ton. May gave me some great work including some lateral work and starting to reach into the left rein when tracking right (a big accomplishment since getting that wolf tooth pulled). I, however, was horrendous. I’m sure my riding was fine and my aids were correct, but my attitude wasn’t. As the ride wore on, I felt myself asking for more and meeting resistance not with patience and humor (the only two emotions that belong in the saddle according to Mr. John Lyons) but with frustration. After we completed our warm up of all three gaits and some stretchy lateral work, we walked for a bit. Then, when I asked her to trot, ready to start asking for the harder work, she popped up above the bit and threw her shoulder through the transition. I am sure my timing was off, or I hadn’t gotten her properly balances before the transition, but I mentally just couldn’t get past that she was being bad and a jerk. Even worse, I was getting more frustrated with myself for not being able to get past my own frustration…. Sounds great, right? So I stopped. I put big loops in my reins, gave her a pat for the work she had done earlier, and we walked a bit longer. The total ride was only 32 minutes… and Equilab tells me that 24 minutes was spent walking. My next chance to ride was Thursday. 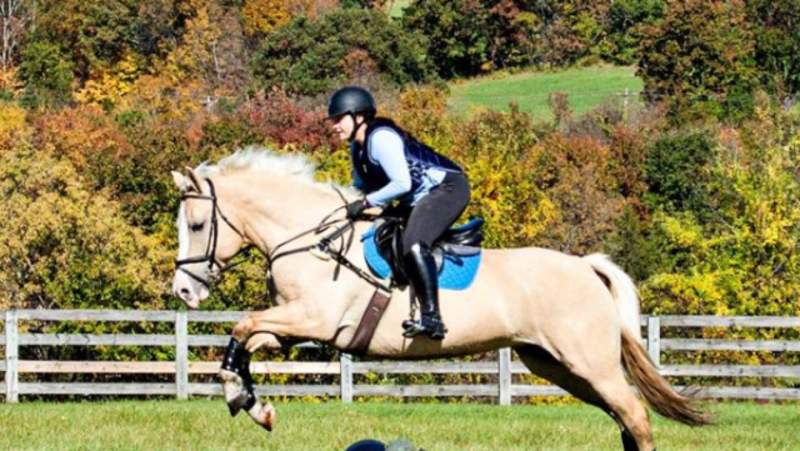 I threw my jumping saddle on and planned on just doing an easy flat hack. ~40 minutes, no pressure. When I got to the arena, there were 3, 18″ fences lined up through the middle of the arena. After our rhythm issues on Sunday, I figured it would be a great idea to add that line into our hack. I won’t go into details, because the ride was REALLY boring and simple. However, it was good. I was able to be fair and effective in the saddle, and my horse is better off because I stepped away on Monday. ugh i hate it when i can totally tell that my attitude is a problem in a ride and that i’m getting too frustrated, which in turn only makes me *more* annoyed and frustrated. it’s such a spiral, blargh. good on you tho for just saving it for another day – and awesome that the next ride was so much better! I can so relate to this. Just like the above commenter-it just makes me more frustrated! So impressed you were able to just take a moment and save it for another day. Kudos to you! Thanks! As riders, we have to be honest with ourselves when we just… cant. There will always be a better day. Right? The whole “Always end on a good note” thing… Like, can walking on a long rein and not getting into a fight with my pony be “winning” and “ending on a good note”? I am going with that! I admire your ability to stop your ride when things weren’t going well. I normally try to make it better first, which always ends up making things worst. As much as we’d like to, leaving our frustration out of the barn just doesn’t really happen. Good on you for realizing and just deciding that today wasn’t the day to work on stuff. I’ve been trying to manage my emotions and frustration with riding things a lot more lately. It’s difficult but it is worth trying to get control of. This probably sounds pretty “out there”, but meditation has done a lot to help me. Ive done meditation before, but it was guided during martial arts classes. I liked it then, but i cant seem to manage it on my own and all other guided meditations are very spiritual in nature. I use the app “Simple Habit”. It has a lot of free meditations that change regularly. None of the meditations I have come across in the app have been Spiritual. They have more about Mindfulness for the most part.